The scholastic chess season is still going and the John Bapst Chess Team continues its rise through scholastic chess rankings in Maine. Mostly recently, Bapst Crusaders brought home the Claude Webber Memorial Cup. In 2018, the Bonny Eagle Chess Club founded the Claude Webber Memorial Cup Tournament, named for a longtime educator and principal in SAD 6. Not only did Claude Webber serve as principal of George Jack Elementary School in Standish for several years, but he also served as a bomber pilot over the European Theatre in World War II, flying more than thirty combat missions over Germany and Austria. 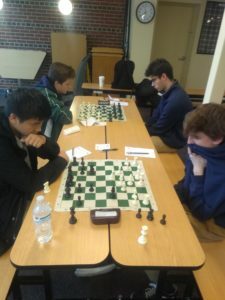 To commemorate the event, Bonny Eagle’s chess team host a cup championship tournament for scholastic chess players that serves as the last chance to compete before the final scholastic state championship. This year, the Webber Cup featured six high schools, including John Bapst, Cheverus, Westbrook, Bonny Eagle, Thornton Academy, and Cape Elizabeth. In four rounds of five-on-five match play, the John Bapst team of Benjamin Mock, Prince Wang, Leo Wlodkowski, Tony Huang, and Gavin Worcester came out on top to win the title. In addition, Khanye Cogdell played in the Reserve division, scoring the title of High School Reserve runner-up. Both of the traveling trophies were cut from a massive tree that stood in the yard of Bonny Eagle coach and tournament director Oisin O’Searcoid, and each traveling and individual player trophy was turned by another Bonny Eagle chess coach, Andrew DeMaris. The traveling trophies we have to show off weigh almost 40 pounds! The John Bapst Chess Team will now prepare for the Maine State Individual Scholastic Chess Championship, hosted at John Bapst on Saturday, March 30th. John Bapst shared a link. John Bapst shared a post. We'd love to hear your alumni news for our upcoming magazine, "The Round Table." It's easy. Contact us online at https://t.co/WNWW1z4tdA or send a note to Jennifer Tower, John Bapst Memorial High School, 100 Broadway, Bangor, Maine, 04401. Thank you! Winter Sports Start Monday, November 19! 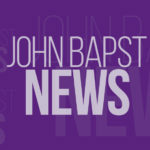 Team Meetings will be held the first two nights of the season at John Bapst. Details on the schedules will be released by the end of the week! #GOCRUSADERS!